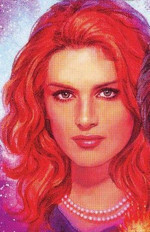 Mara Skywalker. . Wallpaper and background images in the Mara Jade Skywalker club tagged: starwars marajade. This Mara Jade Skywalker photo might contain portret, headshot, and close-up. She is so Beautiful. :)she is the WHOLE reason I got back into Starwars.